This guide is only focused on solving engine noise so far. As I have more time, I will add other data. I have owned and repaired 9 similar bikes over 20 years so there will be lots more added as I get to it. ?1. 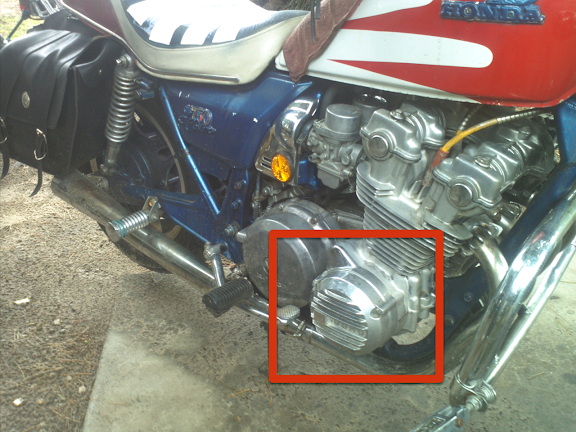 IN STEP #1 … why remove the AC generator cover IF using IDLE method to tighten instead of hand crank? ANSWER: I find no reason yet, plus this is usually hard and corroded and could break if being removed. ?2. IN STEP #2 …. 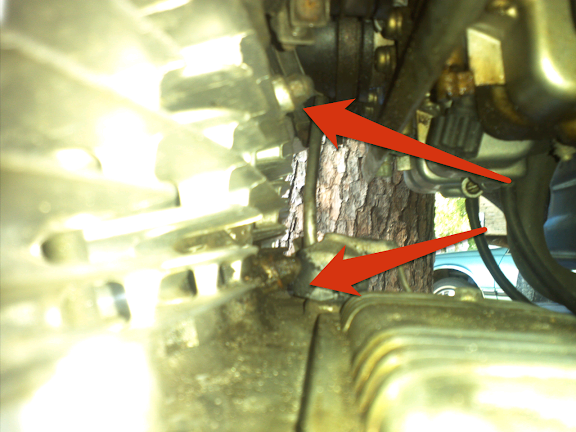 how tight do you tighten the tensioner bolt while rotating the crankshaft? ? 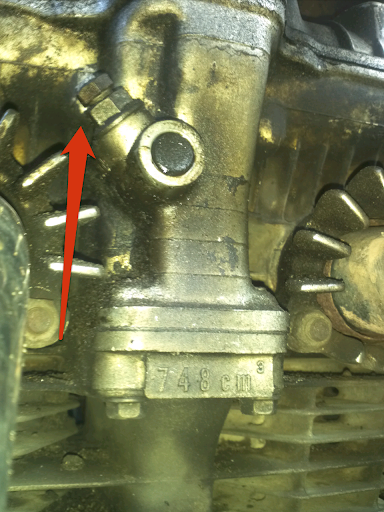 IF the bolt is tight, is it possible it is stuck and the tensioner is not working correctly? I have read you can take the bolt all the way out and thread a tail light bolt down on the tensioner itself to wiggle it loose. The manual says DO NOT DO THIS however…. thoughts??? ANSWER: Use the 2 finger rule. Once you feel tension on the bolt, stop!! Do not go tighter then you can easily turn with two fingers. COMMENTs needed on how to know if it is stuck? ANSWER: No problems have been reported by those who have turned both REAR tighteners separately. ?4. 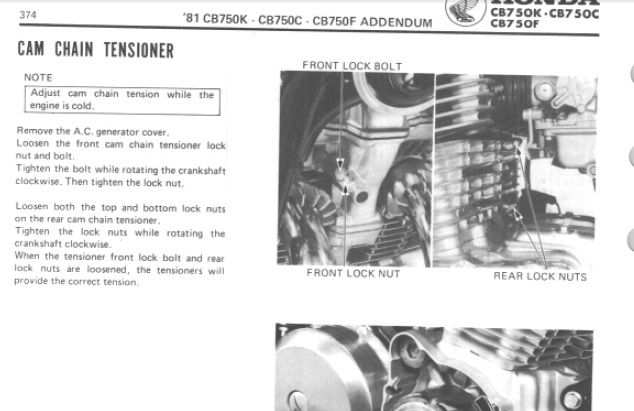 AT the end of the manual directions … WHY DOES it state “WHEN THE front tensioner is loosened, the tensioners will provide the right tension”??????? Is in implying that you repeat the process again in the front for the final step???? NO ANSWER or Feedback yet! ANSWER: no one says for sure but it is widely recommended to start while tight. The tensioners automatically adjust after the bolts are loose so you want tension on the cam chains to ensure they’re tight. Spin it by hand OR adjust while in IDLE to maintain that tension. 10mm with ratchet wrench on one end to turn upper rear tensioner. 12mm to turn front lock nut. Level bike on center stand! 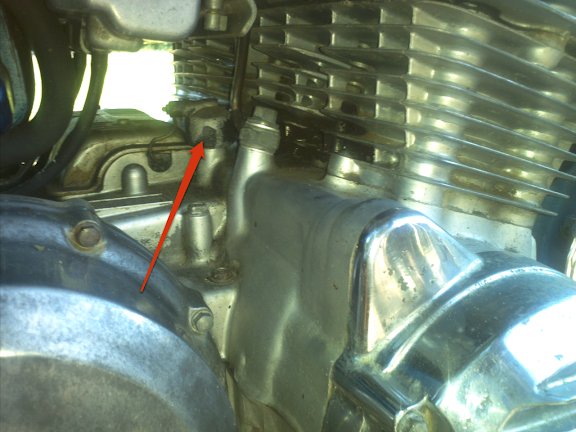 Consider removing AC generator cover with arrow in picture below OR the side points cover to turn crankshaft by hand. The AC generator could be corroded and break so I recommend just idling the engine instead. START and idle the engine. Loosen FRONT CAM Chain lock nut and bolt. Then tighten the bolt while rotating the crankshaft clockwise and then tighten the nut. (THIS CAN BE DONE WHILE IDLEING instead of turning by hand) In my experience the bolt was already tight with tension.
? IF the bolt is tight, is it possible it is stuck and the tensioner is not working correctly? I have read you can take the bolt all the way out and thread a tail light bolt down on the tensioner itself to wiggle it loose. The manual says DO NOT DO THIS however…. thoughts??? KILL ENGINE AND Loosen BOTH the top and bottom REAR tensioner lock nuts. START and IDLE engine. TIGHTEN them WHILE ROTATING THE CRANKSHAFT clockwise or while IDLEING the engine. **ONLY NEEDED IF manually turning the carnkshaft. Put the AC Generator cap back on and/or the points/crankshaft cover. While trouble shooting carb issues, these following videos will help. If you reverse the wires on the coils is doesnt matter.Like if you revers 2-3 or 3-2. They fire together since they are hanging out of the same coil. Level bike on center stand! Run the bike for 1 minute to warm up and stretch the cam chain. Remove the tappet covers for cylinder 1 (free’s up engine valve for turning!) THIS IS THE OUTTER CLUTCH LEVER SIDE CYLINDER. Your left if sitting on the bike. STEP 2. Remove the points cover and rotate the engine to “T” mark. STEP 3. Check BOTH valves on #1. IF tight rotate 360 degrees. I am not sure how to decide this. Someone please comment. STEP 4. 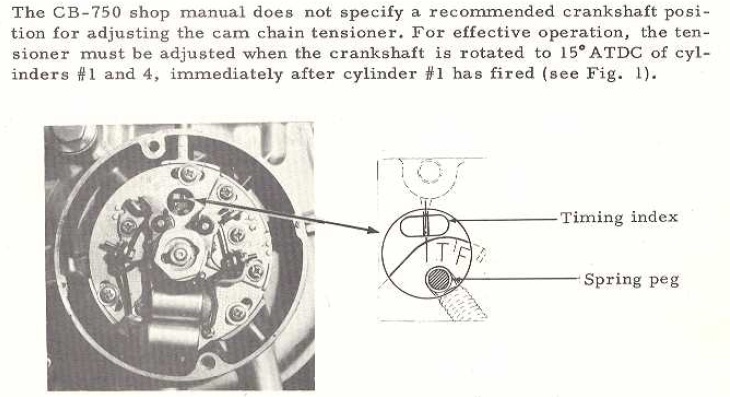 Rotate crankshaft clockwise until it matches the diagram below. This is the 15deg ATDC 1.4 position. *IF nothing happens and you are certain the arm spring is stuck, you can take the screw out of the tail light cover and thread it in to move the arm free. STEP 6: Re-tighten setting screw, then lock nut then point and tappet covers. on the end that goes into the head and the other end is still 6mm. Just retap and use red Locktite. Time serts are used on bolts that are going to be taken in and out on a regular basis. Like spark plugs. One more thing.. The size of tap and drill problem. When you buy the TAP many times the package tells you the drill size, and sometimes the tap and drill are sold together. IF all of that fails just go to Google and type in “TAP drill chart”. If the next size bolt is not holding, get a heli-coil. Problem: Brake lights and dash out but fuses are good?! I have my friend shim the valves but I didn’t take pictures or take notes on the details. If you find a good guide and picts on this let me know so I can add it to mine. After shimming, my bike runs like new, leaks less, idles/starts perfect and the ticking is minimal. 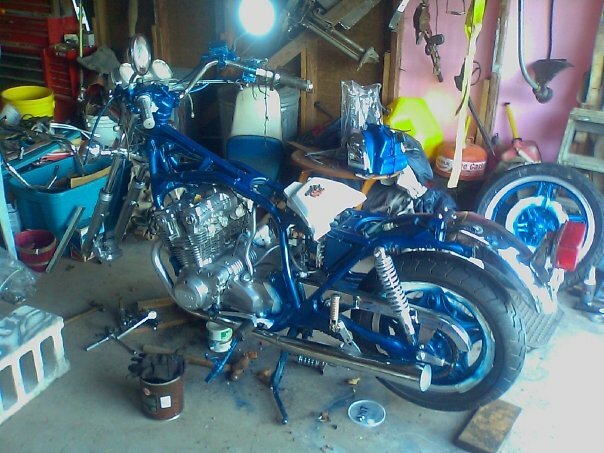 hi i have a cb750c 1982… i took the engine apart to redo valves and rings etc.. now i m trying to assemble it back together.. i need lots of info.. torque data,.. timing chain for cam shape and crank case,.. engine head.. etc etc.. i been looking online for a clymer book or anything else with all the know hows i need .. can u help.. do you have any online manual ??? tx for your help. There is something very wrong with my 79 cb 750k. There are four holes in the engine wall were the timing chain runs. Have you seen this before? 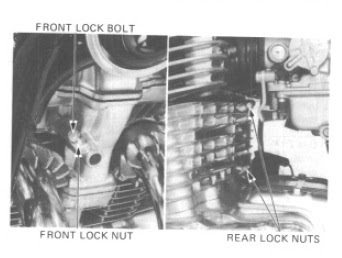 i noticed that some of the steps copied from the Honda manual here are from a DOHC book and others from a SOHC book. 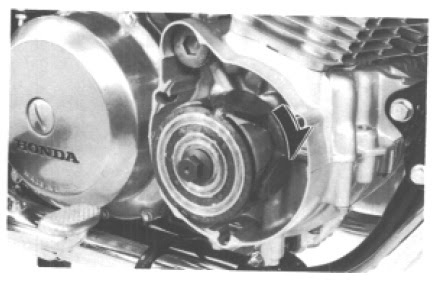 problem is these are very different engines and books, for instance the SOHC book copied from above shows this engine with points and condenser, which the DOHC does not have. it has electronic pick up coils instead and no timing marks to work from on that side of the engine. my concern is that this might make these instructions confusing or even misleading for someone who doesn’t know the difference between these two awsome engines, or for a relatively inexperienced mechanic.